SAMPLE SOUND REVIEW: Lightless for OMNISPHERE 2 by String Audio - REVIEW ! Lightless for OMNISPHERE 2 by String Audio - REVIEW ! STRING AUDIO legendary samples and sound design skills meet award-winning Omnisphere 2 virtual instrument, the result is an incredible library of hybrid, organic signature patches, and multis that will bring a whole new palette of sounds colors in your music productions. 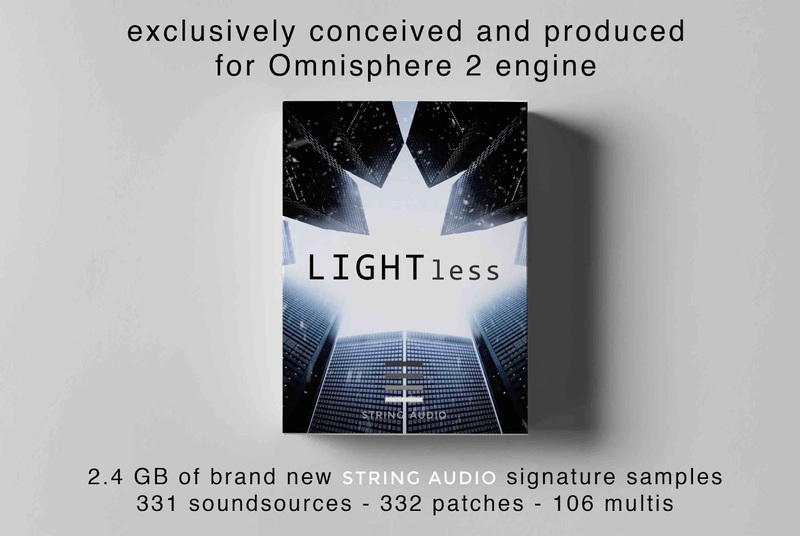 ALL patches and multis contained in LIGHTless have been created using the brand new original sample content produced and recorded by String Audio exclusively for Omnisphere 2. All incredible power offered by the STEAM engine, including his synthesis capabilities, Orb engine, and modulations options has been implemented to create state of the art patches and multis. Sounds range is extremely wide, ranging from dark deep and distorted drones and textures to delicate and evocative pads and keys, with also a vast array of pulses and percussive patches and multis. LIGHTless is a must-have library for the modern film, game and TV composer that want to bring to a new level his musical and sound design projects. Require Omisphere 2.3 or above (sold separately by Spectrasonics). A Powerful addition to your Omnisphere 2 libraries. The multi instruments are incredible layered with dark inspiration. I could not stop playing this instrument and created some enormous tracks in a really fast time. Just like the Dark Matter and Alchemist series for Kontakt I must say this is a must have for any Omnisphere 2 user! !